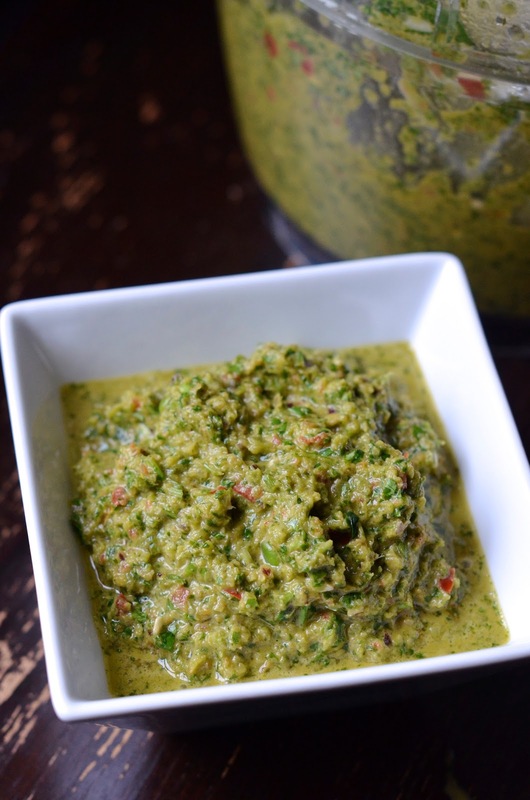 Sofrito is a staple in every Puerto Rican household. Essentially a pureed mix of herbs, spices, and aromatics, it serves as the base of most classic Puerto Rican recipes. It's also an amazing shortcut, saving you tons of time in prep and clean-up throughout the week. It only takes about 30 minutes to prep, and then will last you for weeks or months. When you're ready to cook, just toss a few spoonfuls of the mixture in your hot pan and let it sizzle--no need to chop onions, garlic, etc. Growing up, my family regularly traveled to Puerto Rico to visit relatives. These were the days before strict regulations about what could be packed in your carry-on luggage, and many homesick Puerto Ricans would take advantage of the opportunity to stock up on favorite ingredients and foods. On one flight home, a man sitting a few rows in front of us yelped and jumped up, his head and shoulders covered in oily liquid. The woman next to him was equally distraught, moaning loudly that the jar of sofrito her grandmother made her must have broken and spilled out of the overhead compartment. Other passengers seemed to agree that her situation was worse than that of the sauce-covered man; after all, a shower is easily had, but a jar of abuela's homemade sofrito is priceless! Combine all ingredients in a food processor or blender, and puree until very smooth. Store in a glass jar with lid, or divide into heavy-duty freezer bags and freeze for future use. You can also divide it into ice cube trays for freezing, then transfer to bags for easy to use single-serve portions. Will keep in refrigerator for 2 weeks, or up to 6 months in a freezer. NOTE: culantro, a strong but similarly-flavored cousin of cilantro may be difficult to find at conventional supermarkets. Look for it among the other fresh herbs at Latin grocery stores. If you can't find it, you can substitute with another half-bunch of cilantro.